New Covenant Missions recruits, trains, sends and equips Indigenous church planters to be strategically sent to the darkest places in Africa. we have created a sponsorship program so that individuals and churches in the u.s. can be directly involved with our indigenous teams on the field. Through this sponsorship program, we provide the Church Planter families with the basic costs of living. we continue fundraising in order to equip them with various tools such as seed money to launch small shops, mountain bikes or motorbikes, portable solar powered Jesus Film kits, solar powered audio bibles, discipleship training, Muslim evangelism training, community health evangelism training, community development projects (public latrines, fresh water, medical services), and whatever else it takes to empower the church to grow! Our goal is to plant locally sustained churches. Typically, the church planters go into an unreached area and work for three years to make disciples and train up leaders. Once a local church is established, the leadership raises money to sustain the church. Once the church is sustainable, the church planter begins to plant another church in a different area. Currently none of the churches planted by our church planters require outside support. What is even more exciting is that every church is planted with the “DNA” of multiplication and are immediately focused on evangelizing nearby villages and planting their own 2nd and 3rd generation churches! As long as the Church Planter family is willing to continue moving and planting churches we continue to support them in their calling. The relationship built between the Church Planter family and their American sponsor truly is the most priceless part of the strategy as it ministers to both families. Sponsors receive quarterly personal reports and are given opportunities to visit, pray for, and equip their Church Planters. 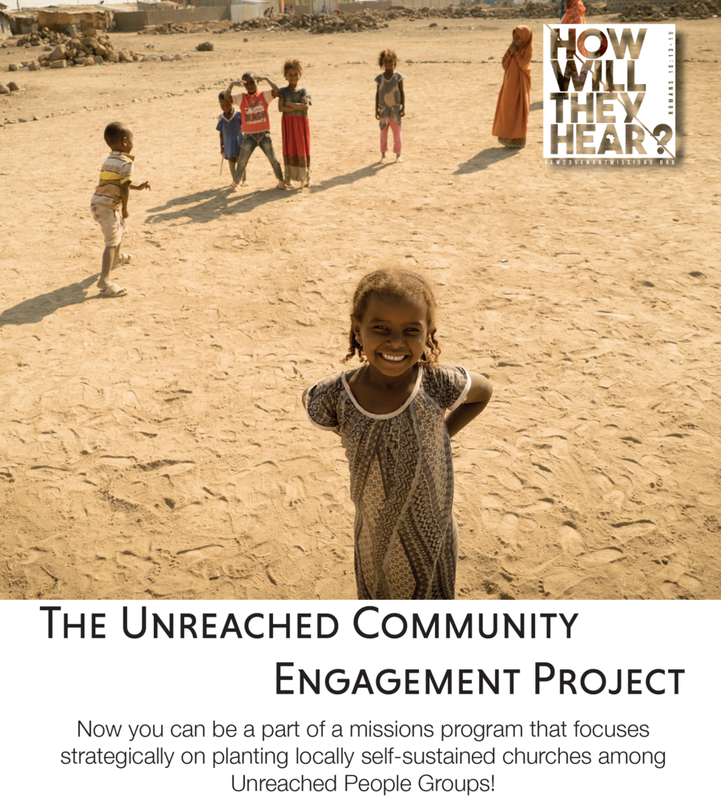 The UNREACHED COMMUNITY ENGAGEMENT Project is A LARGER SCALE CHURCH PLANTING PROGRAM designed to TRANSFORM ENTIRE VILLAGES AND create a relationship between churches, SMALL GROUPS, BUSINESSES, AND INDIVIDUAL DONORS in the U.S. and Indigenous Church Planters and the unreached communities they serve in Africa. Our desire is to empower groups of believers in the U.S. to join hands with our Indigenous Church Planting Teams in Africa to see God’s love brought to the DARKEST places in Africa! Perhaps you would consider hosting a sponsorship event at your church, business, or home group? One of our staff members would love to share the incredible stories and videos we have from the field! Will you join us to mobilize the FOLLOWERS OF JESUS IN THE U.S. to reach the unreached? Every church planting partner receives photos, testimonies, and quarterly reports of the amazing things God is doing to reach the unreached in Africa. You may even have opportunities to visit the project on the field! click the button below to see the details of the unreached community engagement project designed for churches, businesses, FOUNDATIONS, INDIVIDUALS, and small groups! Showing the LOVE of Jesus in a practical, holistic way! During the church planting process research is done to discover the various needs of the community. We then hire local indigenous people or partner with other local development organizations to provide fresh water wells, public latrines, sanitary meat slaughter houses, community health education, medical service through medical missions, emergency food and water relief in drought situation, and more. There were no churches, no believers, only violence. Now there are two churches and over 100 believers! Join us as we work to develop this village! Click the button below to learn more! New Covenant Missions has partnered with INDIGENOUS ETHIOPIAN MEDICAL PROFESSIONALS to send out short term indigenous medical mission teams to provide free medical care to thousands of people in some of the poorest villages in the world! Our strategy is to partner the medical professionals with our church planter teams for 4-7 clinic days to provide physical and spiritual healing to people with little or no access to medical care. On average, these missions only cost about $8,000 to serve 2,000–3,000 people! When possible, we also invite medical professionals from the U.S. to join us on these missions! If you are a medical professional and interested in joining us on a trip please contact us for more info! The majority of our medical teams are local Ethiopian medical professionals. On average, it only costs $8,000 to do a 5 day mission that serves 2,000-3,000 people! In order to make these missions possible we need the funding for their lodging, food, and travel. Would you consider donating today?